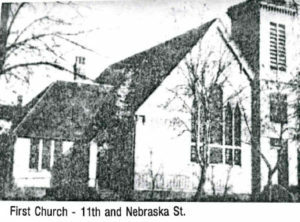 Northwest corner of 11th and Nebraska Streets. p.m. with Wednesday prayer meetings at 7:30 p.m. 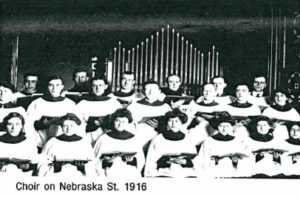 The following May 1895, the Rev. J. Alfred Koser became Trinity’s second pastor. hard year, as membership and attendance fell when many people left town. September 1899. In two years, a recovery was made and by the time Rev. dismissed 34 by letter, lost 3 by death, and many by removal and otherwise.